Dancing Away ‘is a visual representation of Baryshnikov’s very personal interpretation of dance and performance; an expert reflection upon his own metier. As a photographer, Baryshnikov is in the unique position of ‘insider and outsider’ simultaneously and he admits to ‘taking thousands of images and it takes me a long, long time to select. My eye catches it and my heart stops. This is exactly what I want’. Nowadays Baryshnikov always travels with his camera, which on some occasions stays dormant for the duration of the trip, while on others he hardly pauses in clicking away. Contini Art UK is located in New Bond Street and its uniqueness lies in the fact that it is a large gallery spread over two floors, offering you an artfully peaceful refuge in the centre of a very busy city. When you enter you see a vast white space with a sort of industrial feel, with piano music softly playing in the background. Each framed photo – they are quite large which makes for quite a striking impact – is complex, yet mesmerizing in its depth and beauty. It is not just Baryshnikov’s trained eye, it is also his awareness of the body and movement as well as the human ability to control it, which is second nature to profession dancers, that make his images truly captivating. What Baryshnikov also manages to do, according to Dr. Diego Giolitti, Contini Art UK sales director, is to ‘translate images into a visual work of art. None of the images are staged’ and yet Baryshnikov combines control and freedom by the images he captures. The collection of images is vast and it showcases the richness of the art of dance, taking you from Hawaii to Polynesia, from a tango lesson or to a ballet production or class. You see Baryshnikov’s own translation of the love of broad spectrum of dance, ‘its quintessence’. Baryshnikov creates the sense of movement throughout the technique known as ‘long exposure photography’, which involves opening the camera shutter for a long duration, thus exposing the lens to more light. The result of this technique is the blur, causing the colours and bodies to appear dragged across the print which creates for an unusually surreal, reflective effect. Mikhail Baryshnikov describes dance as ‘an activity of the human spirit’, believing that ‘art, when your heart is burning but your mind is cool – that is the best combination’. When you stand in front of any of the photos you observe the spontaneity and freedom of the way that dancers express themselves, irrespective of the style of dance. If you are a fan of dance in general then I am sure no matter how many production you have seen you never stop to wonder how agile the dancers bodies are, how free yet precise their movements can be. This exhibition puts the focus on the dancer, letting the background be the subtle frame of the way each dancer expresses himself, be it on the street, on the stage or at the rehearsals. I am lucky to have a copy of Mikhail Baryshnikov’s book of photographs called ‘Moment in Time’ published in Moscow in 2005. In it Baryshnikov explains that ‘taking a photo has a way of burning a moment in your brain, not just the image captured in the actual photograph, but all the tiny events that come before an after’. In the foreword to the book he talks about photography and art being a natural fit and how being brought up in Riga, which bathed him in the landscape of greys – of the sea, the light and even the water, all being ‘the interplays of soft charcoals, pale silvers and leaden blue-blacks of infinite variations’. Layer it with the exposure to the Soviet photography of that era, add the images from Polish and Czech magazines and seeing the work of Cartier-Bresson, Irving Penn, Ilse Bing & Richard Avedon ( who actually hated being photographed but a few months before his death he allowed Baryshnikov to photograph him, which speaks volumes of the trust he must have placed in Baryshnikov’s fingers, eyes & lens ). Baryshnikov also knows really well the modern doyenne of photography Annie Leibovitz who has taken many images of him in the past, including one of him below. I would imagine that he has learnt a great deal from her in their photo sessions throughout the years as well. What this exhibition does is that it helps you to discover the art and soul of dance through the eyes of a trained dancer, as well as skilled photographer. Layer it with your own vision and impression and you will leave the exhibition with the visual memories that will sustain your inner world for the days to come. Each photograph comes in an edition of three and with each purchase the new owner will also get a special edition of the exhibitions catalogue which is done in the style of the work folder, with loose pages of each image forming part of this exhibition. I have seen the exhibition twice already and will probably go and see it again before it comes to an end. There is one particular image that is imprinted in my memory – that of an elderly couple dancing the tango. There is strength and tenderness in it and it’s beauty is strikingly powerful and touching in equal measure. There is the dramatism of emotion and the quite moment of reflection on how united those two people look, by their life together and by being immersed in each other and the music. In our fast paced society we tend to celebrate youth and forget that the beauty and emotion only ripens with age, creating the most touching realm of wisdom & depth that comes from within a person. Baryshnikov manages to capture the moments in time that are both modern yet timeless and that is a skill of a true artist. 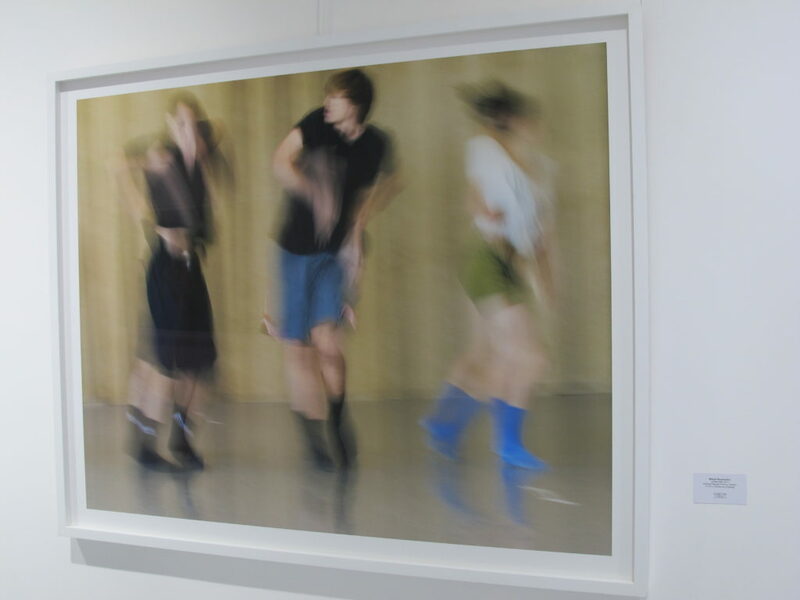 ‘Dancing Away’ photographic works by Mikhail Baryshnikov is at Contini Art UK, 105 New Bond street, London, W1S. The exhibition runs until January 31, 2015.